This video is intended to assist staff in providing behaviorally appropriate, individualized, baby adapted care for the full term newborn using the best practice of skin-to-skin contact in the first hour after birth. Section 1: reviews the importance of skin-to-skin in the first hour and shows examples of newborns in the 9 stages of the first hour after birth. Section 2: offers practical advice for staff after a vaginal birth. This section follows a vaginally born baby through the 9 stages of the first hour. 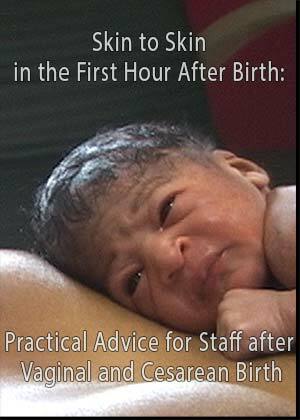 Section 3: offers practical advice for staff after a cesarean birth. This section follows a cesarean born baby through the 9 stages of the first hour. Produced by the Healthy Children Project, Inc., Inc.
Purchase the DVD or you can now rent Skin to Skin in the First Hour After Birth or download to own with unlimited viewing from Amazon.com or Healthy Children Project, Inc. 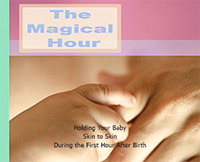 The breathtaking award-winning video for prospective parents,The Magical Hour: Holding Your Baby skin-to-skin for the First Hour After Birth is perfect for birthing classes, lactation consultants, and anyone interested in implementing skin-to-skin in the first hour. The video guides you through the beauty and magic of the first hour after birth and a baby's nine instinctive stages. Each of these stages are beautifully illustrated and discussed. Combining stunning videography of babies during this amazing time with the humorous and practical insights of real parents and the grounded research of international experts. This video is both heartwarming and informative. This video that is an essential teaching tool for all childbirth educators, labor and delivery wards, and lactation counselors! For more information go to our website dedicated to the Magical Hour. You can now rent The Magical Hour for 24 or 48 hours or download to own with unlimited viewing. Birth Strategies See how different mothers manage the challenges of labor with movement, relaxation techniques, immersion in warm water, breath, massage, and partner support. Witness the astonishing moment of birth - watch a woman become a mother, a couple become a family. Labor Strategies Mothers use massage, warm water,and breathing to manage pain. Continuous Support Partners provide crucial emotional support and encouragement. Movement See how pain can be managed through movement and positioning during labor. Skin to Skin Watch mom and baby meet--the miracle time, the magical hour, immediately after birth. Labor Strategies: Mothers use massage, warm water and breathing to manage pain. Continuous Support: Partners provide crucial emotional support and encouragement. Movement: See how pain can be managed through movement and positioning during labor. Skin to Skin: Watch mom and baby meet--the miracle time, the magical hour, immediately after birth. For more information go to our website Happy Birth Day! This full color poster documents a baby's 9 instinctive stages the first hour after birth. Photographs beautifully depict each of the 9 stages. A lovely full color photo book with stunning images of each of the nine stages. Intended as a simple educational tool for parents, this book is sure to peak the interest of perspective parents and have them wanting to learn more about skin-to-skin in the first hour. A double sided tear-off pad which explains the benefits of holding your baby skin-to-skin in the hospital for healthy term babies, the special care nursery and at home. This tear-off pad clearly explains the nine observable newborn stages that occur when a baby is in skin-to-skin contact after birth. Available in English or spanish.